Alien Creeps TD APK 2.5.2 offers what competitor can’t do in tower genre. As you know, using tower as base defense form invader is not a new thing. However, developer of this game modifies standard concept into more stunning story. In this game, you are in charge for operation to defend and expand tower. Several troops will help you with various skills. As for background story, developer makes alien from another galaxy as the main villain. Invaders bring ton of minions to conquer the planet earth. The reason is still unknown, but you have to maintain the strong base. Tower type game is similar to strategy genre. You have limited resources to survive in harsh environment. Obstacles come more and more without any sign of being stop. 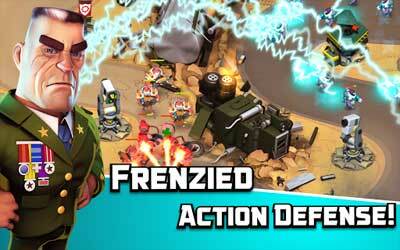 You will use heroes with high skill combat to confront the enemy strike. For the front line, infantry is enough for holding ground. As game goes on, several items will be unlocked and you get more resource to build advance tower. Moreover, engineer will help you in this matter. This game has special stage with specific challenge. You pass this stage then get more money. It is separated mode from main game story. One of interesting sections is the explosive levels. Developer creates fifty level of bomb that can be used to destroy enemy at one strike. It is very effective to minimize casualty from your side and make enemy retreat for a while. However, player should keep alert because alien minions come quickly without hesitation. This game has good graphic and interface. You can see clear movement of enemies or troops in smartphone screen. This game does not show any harmful effect, so you can enjoy the graphic perfectly. Developer makes this game as free app, but certain items require real money to buy. All of features in Alien Creeps TD for android are enough to keep player interested. Invite allies to join this all-out war and share Airstrikes and Reinforcements with them!